Walter G. Moss is a professor emeritus of history at Eastern Michigan University. For a list of his recent books and online publications, click here. 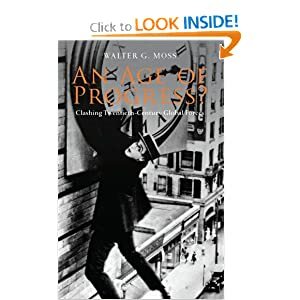 He has previously written on mass culture, along with other topics, in his “An Age of Progress? Clashing Twentieth-Century Global Forces” (Anthem Press, 2008). We want our leaders to exercise political wisdom. At least, we do if we think about it. Does anybody really desire unwise leaders? But what do we mean by political wisdom? What virtues and values does a wise leader possess? The present essay, condensed from a much longer footnoted essay, attempts to answer these questions. It does so partly by looking at what past thinkers, starting with Aristotle, have said about political wisdom. Since the end of practical wisdom is some type of action, skills as well as virtues are necessary for its realization. For a president, for example, being an effective communicator and a good judge of people so as to select effective cabinet and staff members are important skills to possess. But here our emphasis will be on the virtues and values a president should possess. In the remainder of this essay I shall identify the following virtues and values that seem especially important for exercising political wisdom in today’s world: the proper mix of realism and idealism, compassion, empathy, humility, tolerance and a willingness to compromise, a sense of humor, creativity, temperance, self-discipline, passion, and courage. Finally, I will argue that practical wisdom or prudence is necessary in order to properly balance, prioritize, and fit together these virtues and values in any particular situation so as to achieve the greatest good. Three of the twentieth-century’s most prominent commentators on political wisdom—Maritain, Isaiah Berlin, and Reinhold Niebuhr—stressed the necessity of an ethical realism when approaching political problems. In his essay “On Political Judgment,” Berlin stated that political wisdom involves “an acute sense of what fits with what, what springs from what, what leads to what; how things seem to vary to different observers, what the effect of such experience upon them may be; what the result is likely to be in a concrete situation of the interplay of human beings and impersonal forces.” To Berlin it was the “concrete situation” that mattered, and his enemy was any utopianism that failed to acknowledge the plurality and variety of human existence. “Obviously what matters is to understand a particular situation in its full uniqueness, the particular men and events and dangers, the particular hopes and fears which are actively at work in a particular place at a particular time.” To Berlin, any action that sacrificed human beings today for some utopian future dreams was unethical. Compassion and Empathy. During the 2000 presidential campaign, George W. Bush stressed “compassionate conservatism” and faith-based programs as a means of furthering it. Clifford Orwin, a professor of political science, classics, and Jewish studies at the University of Toronto, writes of it as Bush’s “Defining Idea,” but one that history (especially the events of 9/11) diverted him from implementing. Recognizing that traditionally “liberals are the party of compassion, and have been at least since the New Deal,” Orwin sketches the influence on Bush of such books as Marvin Olasky’s The Tragedy of American Compassion, Renewing American Compassion, and Compassionate Conservatism. Olasky argued that private individuals and organizations, especially Christian churches, had a responsibility to care for the poor and that they could do it more effectively than government welfare programs. A sense of empathy ... is one that I find myself appreciating more and more as I get older. It is at the heart of my moral code, and it is how I understand the Golden Rule—not simply as a call to sympathy or charity, but as something more demanding, a call to stand in somebody else’s shoes and see through their eyes. ... I believe a stronger sense of empathy would tilt the balance of our current politics in favor of those people who are struggling in this society. Compassion and empathy are admirable and praiseworthy personal and social values, but they are generally destructive and immoral political values. In order to implement your compassion and empathy politically, you always take by force what is not yours from some people, in order to give to those other people who are the object of your empathy. That taking by force is evil and immoral, no matter how noble you believe your social goals to be. Humility. In mid-2003, Time columnist Joe Klein wrote, “Bush promised a foreign policy of humility and a domestic policy of compassion. He has given us a foreign policy of arrogance and a domestic policy that is cynical, myopic and cruel.” Whether manifested in domestic or foreign policy, humility is characteristic of wise governments, as arrogance is of unwise ones. In their Ethical Realism, Lieven and Hulsman stress the emphasis that Niebuhr, Kennan, and Morgenthau, placed on nations acting with “a sense of humility.” In his 1966 book The Arrogance of Power Arkansas Senator William Fulbright expressed the fear that the United States was displaying arrogance abroad, especially in Vietnam. On March 19, 2003, the day the United States began its invasion of Iraq, Senator Robert Byrd, the longest-serving member of the Senate and a past colleague of Fulbright, once again criticized the U. S. arrogance displayed toward Iraq. In a 2008 book, Rumsfeld’s Wars: The Arrogance of Power, scholar Dale R. Herspring, a conservative Republican, criticizes President Bush’s secretary of defense for his arrogance, which undermined both his Iraq efforts and his overall leadership. In recent years, political humility has also become scarce in Congress. As Democratic Congressman David Price (NC) observed in late 2005, “humility is out of fashion these days. Political leaders, advocates, and pundits often display an in-your-face assertiveness, seeming to equate uncertainty or even reflectiveness with weakness and a lack of moral fiber.” In November 2010, Newsweek’s religion editor, Lisa Miller, wrote, “Surely no professional group has a weaker claim to that virtue [humility] than today’s divided, self-righteous, and spin-savvy politicians. All government, indeed every human benefit and enjoyment, every virtue, and every prudent act, is founded on compromise and barter. We balance inconveniences; we give and take; we remit some rights, that we may enjoy others; and we choose rather to be happy citizens than subtle disputants. Ideology makes political compromise impossible. ... The prudential politician, au contraire, is well aware that the primary purpose of the state is to keep the peace. This can be achieved only by maintaining a tolerable balance among great interests in society. Parties, interests, and social classes and groups must arrive at compromises. Legislation, under the democratic way of life and the Federal system of Government, requires compromise between the desires of each individual and group and those around them. Henry Clay ... said compromise was the cement that held the Union together. ... Compromise need not mean cowardice. Indeed, it is frequently the compromisers and conciliators who are faced with the severest tests of political courage as they oppose the extremist views of their constituents. All men betray moods and affectations, conceits and idiosyncrasies, which could become the source of great annoyance to us if we took them too seriously. It is better to laugh at them. A sense of humor is indispensable to men of affairs who have the duty of organizing their fellowmen in common endeavors. It reduces the frictions of life and makes the foibles of men tolerable. One politician who displayed both humor and wisdom was Abraham Lincoln. In The War Years, Carl Sandburg wrote “Lincoln was the first true humorist to occupy the White House. No other President of the United States had come to be identified, for good or bad, with a relish for the comic.” He and other Lincoln biographers have furnished numerous examples of his humor, often accompanied by his humility. For example, when he was accused of being two-faced during a Lincoln-Douglas debate, he responded: “If I had another face, do you think I would wear this one?” From Mark Twain to today’s Jon Stewart, political humor has helped us cope with our dissatisfaction with politics. Used effectively by politicians such as John Kennedy and Ronald Reagan, humor and wit have been an asset in increasing their popularity and dealings with the press, the general public, and other politicians. Temperance and Self-discipline. Aristotle believed that temperance (or moderation) and self-discipline should help us regulate “the appetitive faculty,” which deals with our emotions and desires: “The appetitive element in a temperate man should harmonize with the rational principle,” for “the temperate man craves for the things he ought, as he ought ... and when he ought.” Temperance was central because of his doctrine of "the mean," according to which moral virtues should achieve the mean between vices, for example, courage being the mean between rashness and cowardliness. Berlin was more sensitive than many classical liberal or libertarian thinkers to the possibility that genuine liberty may conflict with genuine equality, or justice, or public order, or security, or efficiency, or happiness, and therefore must be balanced with, and sometimes sacrificed in favor of, other values. Berlin’s liberalism includes both a conservative or pragmatic appreciation of the importance of maintaining a balance between different values, and a social-democratic appreciation of the need to restrict liberty in some cases so as to promote equality and justice and protect the weak against victimization by the strong. In his pre-presidential The Audacity of Hope Barack Obama recognizes that “finding the right balance between our competing values is difficult.” As an example, he notes “that even the wisest president and most prudent Congress would struggle to balance the critical demands of our collective security against the equally compelling need to uphold civil liberties.” He also mentions the need to balance freedom and individualism with “a set of communal values, the glue upon which every healthy society depends. ... the constellation of behaviors that express our mutual regard for one another: honesty, fairness, humility, kindness, courtesy, and compassion.” How wisely he has balanced and realized such values and would be likely to do so if reelected will be the subject of a forthcoming essay.